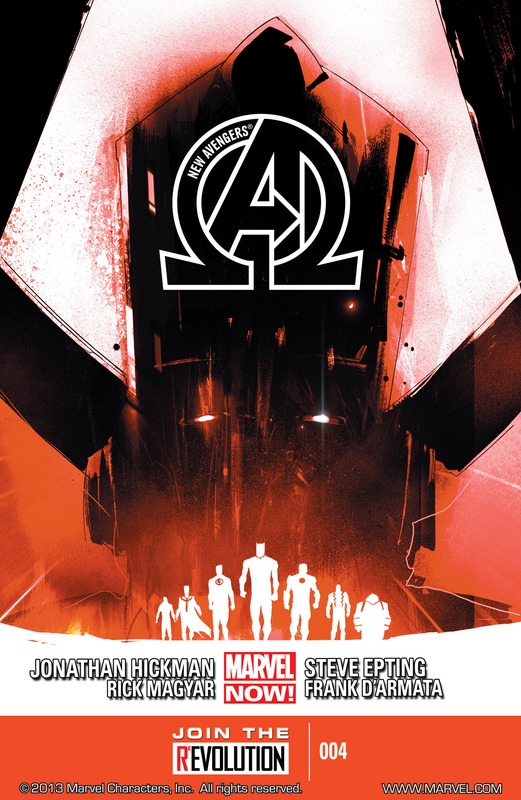 This week saw two different yet similar Avengers releases from Marvel Comics, both written by Jonathan Hickman – Avengers #8 and New Avengers #4. Both show vastly different sides of Earth’s Mightiest Heroes in drastically different yet similar situations. You’ll have my thoughts, after the jump. Jonathan Hickman’s storylines for both titles, adjective-less Avengers and New Avengers, while currently unrelated, are very close in theme. It’s about parallel universes. As I’ve said before Hickman seems to be angling this concept through his two Avengers titles as he makes his way toward the big crossover event later this year, Infinity. And all indications seem to point toward it being a Marvel version of DC Comics’ Crisis on Infinite Earths. In New Avengers, forces have been destroying other universes, and now our protagonists are jumping universes themselves, learning that the worlds they are visiting are under assault as well. 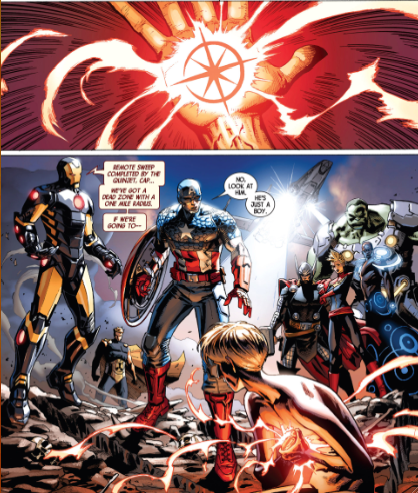 In Avengers, not only are concepts from the New Universe invading the 616, we’re slowly learning about the creators of the multiverse, and how their system has collapsed. Something big is happening. 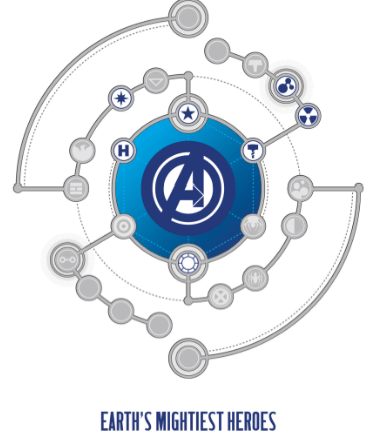 Based on Hickman’s past Marvel efforts in both the Fantastic Four and S.H.I.E.L.D. titles, I can’t think of a better man to handle such cosmic issues. However, I just hope he hasn’t burned himself out on such things. I hate to say it. He may be showing cracks. You know from my previous review of the adjective-less Avengers title, that right now, the New Universe is being spotlighted. The 616 has its own Nightmask, and now it has its own Starbrand. After the latter accidentally blew up his college getting his powers, the Avengers arrive on the scene to confront this new Starbrand, and young man named Kevin Connor (a play on the name Kenneth Connell, the original New Universe Star Brand). The Avengers attack him. I’ve read this issue several times now, and I really don’t get why they attack him. We could go the simple route, without any rationalization whatsoever, and say he blew up a college and killed over a thousand people – let’s get him. Really? If this were an Avengers story of the last decade by writer Brian Michael Bendis, I could have dismissed this to the writer’s typical mischaracterization, but with Hickman… I hope he’s better than this. The Hulk attacks first, then Hyperion condescendingly reprimands him, followed by Thor, first insulting Kevin, then throwing his hammer at him. Captain Marvel then fastball specials the Hulk at him from space. It occurs to me there might be some mind control at work. There is something weird going on here. The Avengers fight a kid. I am amazed that the Avengers so easily attack what is basically a child with cosmic powers he can not control, yet completely accept both Captain Universe and Nightmask, who to me, seem more of a hidden threat than anyone or anything else. Methinks these new members need to be vetted more carefully. I really hope something is going on we’re not yet aware of, and that Hickman is not just pulling a Bendis. I hope the new boss isn’t the same as the old boss. The first thing we all need to understand about the ‘New Avengers’ is that this is not an Avengers team. This is the Bendis created Illuminati, a covert fascist grouping of movers and shakers making decisions for the rest of the world without public knowledge. This is not a team, this is a grouping of individuals, all with different motivations and temperaments. Behind a beautiful and ominous Galaktus (sp) cover by Jock, we have the continuing saga of these characters acting as gods. The whole vibe of “we know better” is getting disturbing. Whereas in the beginning of this series, the Black Panther (still the best portrayal I’ve seen in years) was the voice of reason, he has now become one of the perpetrators. 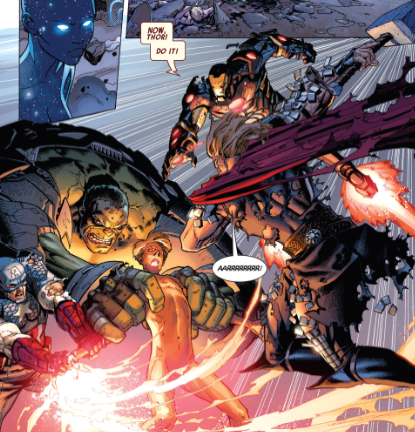 Doctor Strange is preparing for his end, and Tony Stark is building doomsday weapons. 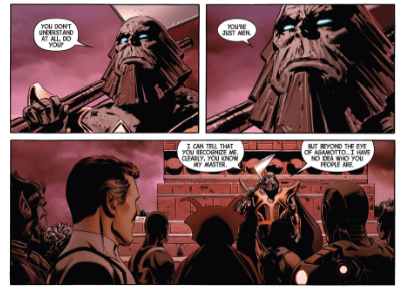 Like the attack on the Starbrand in Avengers #8, I have to ask – who are these people? 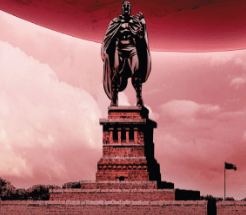 The first world the Illuminati crosses over to has much promise, a Statue of Liberty with Magneto posturing menacingly instead of Lady Liberty, but we don’t a chance to explore those possibilities. Galaktus is about to feed. The group, confronted by Terrax, actually has to discuss whether or not they should stop this from happening. Really? These are most certainly not the Avengers. This otherworldly Terrax knows the score however, in many ways. Now only does he know they’re not from this world, he knows that universes are dying, and finally he suggests that Galaktus is a universal constant. Best of all, and my favorite line of the book, Terrax tells the Illuminati, “You’re just men.” I hope they realize he’s right, before it’s too late. On the positive side I have to applaud the logos and cover designs of both titles, especially New Avengers, which has featured some of the best covers of the year. It is a point of pride for this Avengers fan that just the stylized A is enough to let readers know what comic it is. Classic Avengers artist Steve Epting impossibly continues to get better and better on NA, and I was very impressed with Dustin Weaver on Avengers. In the latter I especially liked the bit where Thor’s chainmail crumbled under the Starbrand’s assault. 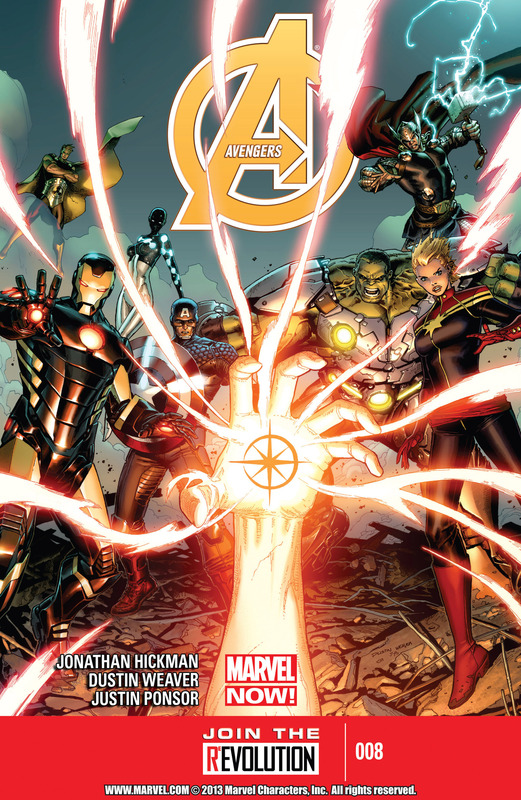 Just started reading New Avengers because of the excellent work Hickman is doing on Avengers. You’re right about the attack on the stunned Starbrand kid: it made me uncomfortable too, in terms of characterization. I don’t think it’s a mysterious plot element, however. I think it was just a storyline misfire. Still a great series – one of my favourite reads right now! Pingback: Avengers Assemble S01 E07: Hyperion | Biff Bam Pop!